Stems: Erect, much-branched above, winged, moderately to densely pubescent. Leaves: Alternate, mostly cauline, basal withering early; petiole present or absent; blade oblanceolate to elliptic, 1.2 to 4.8 inches long, .03 to 1.6 inches wide, margins dentate to entire, surfaces gland-dotted. Inflorescences: Heads 5-100, radiate, solitary or in panicle-like or corymb-like arrays. Involucres globose. Phyllaries lanceolate to linear, strongly reflexed. 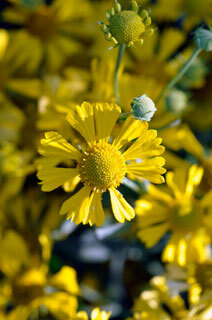 Flowers: Ray florets 10-20, pistillate, fertile; corolla yellow, .3 to .6 inch. Disk florets 200-800, bisexual, fertile; corolla yellow. Fruits: Achenes reddish brown, obpyramidal, 4-5-angled, .04 to .08, moderately pubescent, especially on ribs; pappus of 5-7 tiny, transparent scales. Toxicity: Will cause neurologic problems in horses and sheep when grazed. Uses: The flowers and leaves of various species of Helenium have been used as a snuff to induce sneezing to clear congested nasal passages, as fish poisons, and in the treatment of intestinal worms. Comments: Helenium, for Helen of Troy and autumnale autumn, alluding to the late blooming period.